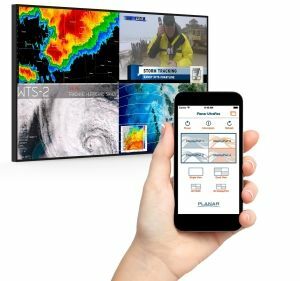 Planar Systems has produced an iOS app that can manage multiple sources on Planar UltraRes Series 4K LCD displays using an iPhone or iPad. The Planar UltraRes app can control 4 displays simultaneously. The Planar UltraRes App gives users free streamlined access to robust UltraRes MediaPlex functionality on its Planar UltraRes Series line of commercial Ultra HD displays. Users can switch sources and screen layouts, managing video content and presentations. It is the first iOS app from a display manufacturer that enables source management for commercial 4K displays. The Planar UltraRes App for iOS is simple to install and is available free for download from the Apple App Store. An Android version of the Planar UltraRes App is under development and is expected to be released later in 2015. The Planar UltraRes Series of 84-inch and 98-inch 4K professional LCD displays are built for resolution-rich commercial applications with a sleek design. All Planar UltraRes Series models come with UltraRes MediaPlex functionality, a feature that enables efficient management of multiple video or data sources. Up to eight sources can be directly connected to a Planar UltraRes Series display. With UltraRes MediaPlex, any of the eight sources can be instantly scaled up to fill the entire 4K display or scaled down into Full HD quadrants to view four sources simultaneously. The app allows users to take full advantage of UltraRes MediaPlex functionality, using a device they commonly carry in their pocket and into their meetings. • Make one-touch source selections. The desired selection immediately shows on the display. Using a mobile device to manage specific display functionality provides an option to a remote control or an AV control system which addresses the needs of AV integrators and their clients who use the displays in their workplaces every day.